Special workshop for policy makers - presentation available! Listen to our short recorded webinar! Are you interested in joining us? After Clim'foot : Italy's progress ! What is an emission factor? What are the databases produced during the project? How to choose emission factors? How to build your own database? What sources are to be used? What are the voluntary programs in the Clim'Foot project? How to use the tool? What to do with the results? Action plan - How to fight climate change? The greenhouse effect is a natural phenomenon. Without it, no life on earth would be possible, with a global mean temperature of near -20°C. Thanks to that greenhouse effect, we know a global mean temperature of 15°C ! The greenhouse effect is generated by the accumulation in the atmosphere of greenhouse gaz (GHG), like CO2, CH4, but also water. The solar energy is first absorbed by the atmosphere, the lands (mainly by the black or dark surfaces) and the oceans. Then a part of this energy is reemitted as infrared radiation (heat !) and return toward space. But the GHG in the atmosphere block a part of this infrared radiation, and make it go back toward the Earth. How solar energy is stored on Earth by the athmosphere? In this way, the solar energy is accumulated inside our atmosphere by the GHG. Basically, more GHG means more energy accumulated. Between 1880 and 2012, a warming of 0.85° of the earth surfaces has been detected. Since 1950, the number of “cold” days and nights has been reduced. The frequency of heat waves is increasing. 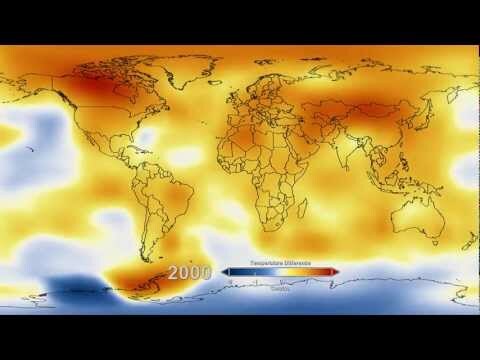 See below a video edited by the NASA, showing that global warming. The Intergovernmental Panel on Climate Change (IPCC) is working since 1988 on the subject. Currently, they evaluate the probability that global warming is caused by human activities as extremely likely (95% certainty). In 2014, in its fifth report, the IPCC has presented some consequences of a global warming exceeding +2° in 2100 against 1850. See the next page "How to react?". Or return to the menu.